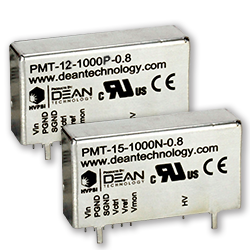 January 10, 2017 - New Yorker Electronics is now distributing the new Dean Technology PMT Series of adjustable Microsize DC/DC High Voltage Power Supplies. The new PMT Series offers standard inputs of 12, 15 and 24 volts, and outputs of up to 1500 volts and up to 1 watt. This series is designed to accommodate such applications as photomultipliers, ionizers and various electrostatic solutions. They have an analog controlled adjustable output, and an industry-leading low ripple for applications that require very stable output. As UL Recognized Components and with CE certification, the power supplies are ready for integration in complex systems. Standard versions of the PMT series are offered with both positive and negative adjustable outputs up to 600 volts through 1,500 volts. Custom versions are also available, with minimum design times, and production costs similar to the standard parts. New Yorker Electronics is a franchised distributor of Dean Technology, including its three main product lines, CKE, HVC and HVPSI. HVPSI manufactures the PMT Series and other high voltage power supplies, multipliers and test equipment.